I would like to thank you all for your kind words after my little meltdown on Tuesday. As predicted, I felt better the next day. I’m working very hard on the blaming myself thing and really, really trying not to do it. It’s a daily struggle, but like everything else, I’m handling it. And on a less serious note, I would also like to thank everyone who recently shared priceless advice for chaffing. I also hope that I won’t need to follow your advice for very long. 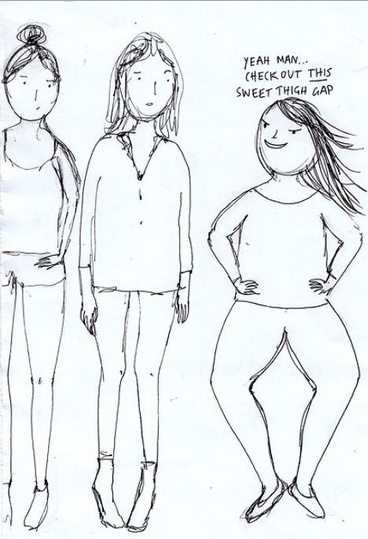 I’ve had the thigh gap before, and I’m confident that I can get it back. I will get it back, dammit. I realize that I’ve been throwing around “Paleo diet” the same way infertiles tend to throw around acronyms without explaining themselves, expecting their readership to be well versed in the endless combination of letters. I’m sorry for assuming everyone understood what the hell I was talking about. It has been exactly one week since I went totally Paleo, and so far, I’m feeling awesome. The Paleo Diet (also sometimes called The Caveman Diet or The Primal Diet) philosophy, simply stated, is an assumption that the earliest men were healthier than we are now, so clearly their diets were superior and modern-day agriculture along with the influx of processed foods has been to our detriment. This is an oversimplification of a diet that has a plethora of books, blogs, recipes and advocates, but really I find the science portion of it quite boring. I originally heard about the diet from my parents, who have hopped on most low-carb bandwagons since Atkins. The real reason that I chose this diet over all others is that it’s easy to follow. Plus, there’s a whole part of it that directly correlates to fertility and pre-pregnancy/pregnancy health benefits, so it felt very relevant to my current situation. The basic principle is that you should eat lots of lean meat, fresh vegetables, seafood, nuts/seeds and healthy fats. You should avoid dairy, legumes, grains, processed food/sugars, starches and alcohol. Fruit is OK in moderation but should be limited, especially if you are trying to lose weight. As I said, the Paleo diet is super easy to follow and requires no point tallying or calorie counting. It’s also healthful and free from chemicals and preservatives, which I’ve never felt good about eating. My mom lost a bunch of weight following it moderately, so I have high hopes for what can happen if I follow it strictly (which is what I’m planning to do). The only problem is that I have to kind of manipulate it to fit my no-fructose plan, which means I have to cut out a lot of yummy fruit. My digestive system is so freaking complicated. By the third day of my diet, I already felt a lot more clear-headed and energetic. Was it just my imagination? I don’t think so. It’s more proof positive that I was eating like absolute crap before vacation. I believe I’ve heard it referenced as a “carb fog” (or did I totally make that up?) Anyway, made up or not, carb fog was gone. I felt strong, capable and alert. That feeling has continued through the entire week. So what have I been eating? Stop pretending you’re not completely fascinated by my diet. Breakfast is usually fresh berries/pineapple and a hard-boiled egg, lunch is a lettuce and spinach salad with assorted veggies and grilled chicken or salmon, snack is a clementine and dinner is a protein (chicken, steak, fish) with tons of veggies on the side and sometimes a small-ish baked potato. Bottom Dollar was selling these huge bags of potatoes for like $1.49, but they are freakishly small (maybe that’s why they were on sale). Anyway, there’s some controversy over whether potatoes are technically “Paleo” or not, so I figure small potatoes are better than giant potatoes. I’ve always had pretty good will power when it came to dieting, but when you want incentive, look no further than the “cheating on this diet could potentially put my future baby’s life at risk” diet. I mean, think of the repercussions. You cheat and have a Snickers? THAT IS POSSIBLY A LIFE OR DEATH DECISION. Really, if I was ever going to stick with something, this is the time. No, I’m not currently pregnant. But this is practice and training for when I am. I have to teach myself to eat this way because once I get that BFP again (wow, confident much), there’s no looking back. I’m sticking to this like no woman has stuck to a diet before. I’m reading every label and interrogating every restaurant manager. I’m not taking one chance on making a mistake and having something go wrong. And if, perchance, something does go wrong… then it wasn’t my diet. It was something else. I’ll have yet another definitive answer. I know people are skeptical that diet can cause miscarriage, but the common refrain I keep hearing is, “it can’t hurt.” So true – it can’t hurt, and it can help. It’s costing me nothing more than a test of will power and some extra time in the produce section. So why the hell not? And just in case you’re curious (I know, this post is riveting), here is a list of Fructose Malabsorption symptoms. Ever read a list of symptoms and think they were written about you? Hello, talk about a light bulb that suddenly clicked on. Interestingly, there are mental symptoms, which could explain my improved state of mind after cutting out the fructose. So I trudge along, eating salad and making “regular” meals for my disinterested and even skeptical husband. I have to say I never liked homemade salads as much as prepared salads (weird, I know), but I’m starting to love and even crave them. The key for me is to add protein, like egg, grilled chicken or tuna to make it heartier. I guess another key factor is not allowing myself to eat anything else. When your options are salad or hunger… salads start looking mighty tasty. 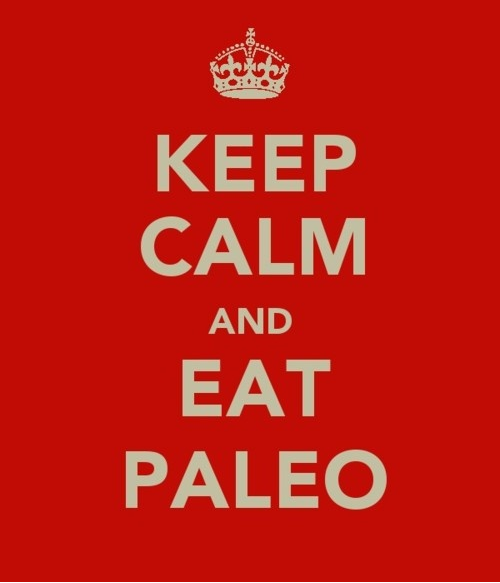 Paleo all the way, baby. And yes, in the space of one week I’ve lost 5 pounds. Already! Woo hoo!